A burger restaurant customer was told "f*** you" in an abusive post from the company's Facebook profile after they complained about a late order. 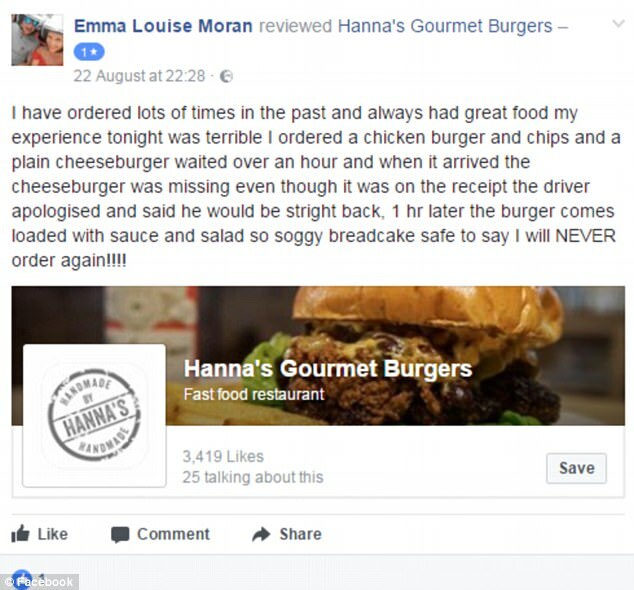 Hanna's Gourmet Burgers posted the x-rated message in reply to Emma Louise Moran after she wrote a negative review on the Hull eatery’s Facebook page. The regular customer claimed Hanna’s forgot to deliver part of her order and then returned an hour later with the wrong burger, reports the Hull Daily Mail . 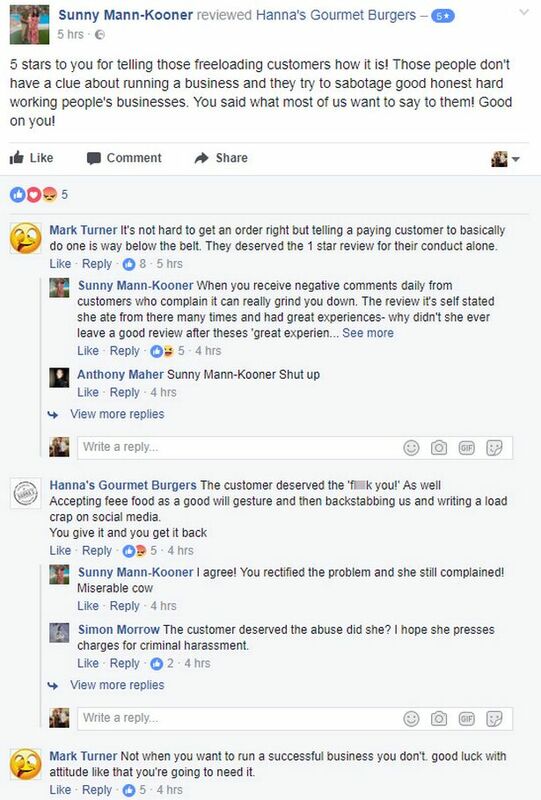 But despite appearing to delete the initial review, Hanna's has refused to let the issue lie , and is continuing to pile on the insults, claiming they were 'backstabbed' by the customer. This is a view the burger restaurant didn't share. Hanna’s responded by writing: “F**k you! "We made a mistake and we put it right as soon as we could. "We also didn’t charge you for your full order. It wasn’t one hour late. "The customer isn't always right, in fact customers like this are just a***holes. "We put everything right and didn't charge you for any of your food, yet you just can't help getting on social media and whining." And in another comment on a five-star review, the issue was brought up again. Hanna's wrote: "The customer deserved the f*** you! "As well as accepting free food as good will gesture and then backstabbing us and writing a load of cr** on social media. You give and you get back." The burger bar’s response prompted a mixed reaction from customers, with some defending their reply, but others pointing out it was a step too far. A spokesman for Hanna's said: “In this particular case we delivered the order on time but it was missing one item. "I was sneered at and spoken down to by these individuals. “Nevertheless, this was put right immediately and as a gesture of goodwill we did not charge the customer for the whole order. Hanna’s was keen to stress the missing burger was returned promptly and as ordered. The spokesman also explained they have a policy of taking on those they perceive to be a "keyboard warrior". The spokesperson explained: “Through the use of social media we are increasingly finding ‘freeloaders’ who want to complain about food with a view to getting something for nothing. “We also live in an era of people craving increasing significance of which such mediums (social media) can give instant gratification, lying is second nature for these people to get what they want. “When I occasionally come across such individuals I show them up for exactly what they are ‘freeloading whiners’. I have even published 'freeloader of the week' and shamed these people for their behaviour. “We are an honest hardworking business who will not tolerate fabricated stories, about our food or service. “Our policy is we put the 'complaint' right immediately and should the individual become a 'keyboard warrior' they will be black listed as have these individuals. “When you understand the hard work we put in to deliver what we believe to be the best product available and someone takes out their 'bad day' on you, I will always react in this way to protect my staff, can you imagine how you would feel if someone commented about your work in such a way? At time of writing, Hanna’s has received 256 reviews on its Facebook page and they have an average rating of 4.1 out of five.